I wanted to write to say a heartfelt thanks for all your support so far in the campaign against the Trade Union Bill. We had a big result in the House of Commons last night, with confirmation of further government climbdowns to add to wins over the last 10 months. ABANDON plans to ban union subscriptions via payroll (check-off), provided the union pays payment processing costs (as many already do). CONCEDE safeguards against politicisation of the union regulator (Certification Officer) and reduce its costs to unions. WATER DOWN plans to restrict union political funds. Changes will no longer apply to existing members, and costs and effort will be much reduced. AGREE TO a review of online methods for strike ballots. This would help increase turnouts. ADD SAFEGUARDS to a new power to cap union facility time. This could happen now only after at least 3 years research and negotiation. DROP extreme measures to restrict protest, pickets and social media campaigns. ABANDON plans to make everyone on a picket show personal data to the police, employers or anyone who asks for it. SCALE BACK the double threshold for strike ballots in “important public services”, to avoid capturing hundreds of thousands of ancillary workers. Make no mistake, there are still some very harmful proposals that could become law, but the bill that passed the Commons today was hugely reduced from what the government originally proposed – an amazing turnabout for a flagship bill at the start of a new parliament. Next step is to see if the Lords will insist on points the government refused last night. And then there will be arguments to come on the mass of secondary regulations and codes of practice still to be published. But today is a day to be proud. None of these positive changes would have happened without trade unionists and supporters uniting to mount a huge campaign. You and tens of thousands of others marched, emailed, signed petitions, held local events, joined consultations, told personal stories in a billboard campaign, and took part in the biggest ever mass lobby of MPs. There’s more to do, but trade unionists and campaigners everywhere can feel justly proud today in what we’ve achieved so far. 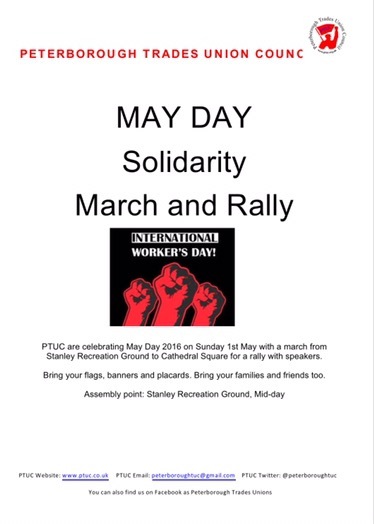 May Day march and rally taking place in Peterborough on Sunday May 1. Steve Sweeney from the National Committee of the People’s Assembly Against Austerity will be speaking at the rally. Assemble at Stanley Recreation Ground from 11.30am for a 12noon start. The rally will take place from 12.30 in Cathedral Square. ST MICHAEL’S AVENUE, WISBECH PE13 3NR. The venue has parking and easy access. Meet and greet will be from 7.00pm. PLEASE ATTEND THE HUSTINGS AND GIVE DAVE AS MUCH SUPPORT AS POSSIBLE. We also have a number of leaflets and flyers to get out for Dave before the Hustings. This is in addition to those already allocated to some volunteers. We will be concentrating this additional delivery in Wisbech, around the Oasis Community Centre so if you are able to help any time next week please let me know. The vote for Cambridgeshire PCC will take place on Thursday 5th May 2016 and we would like to see lots of window posters up before then. If you would like one or two window posters please let me know. These posters in windows really do help to sway the undecided so are well worth putting up. Allergy UK runs a series of annual awareness weeks to draw attention to the plight of the allergy sufferer. These weeks highlight the issues faced by those with allergies, and are designed to get people talking about allergy at key times throughout the year. During awareness weeks, Allergy UK encourages everyone to get involved to show their support! Events take place throughout the week. Through Allergy UK’s national helpline and their website (details below), people are able to receive individual advice and download fact sheets on all aspects of allergy. Allergy UK will be hosting lots of different activities this year, coinciding with their 25th Anniversary! Allergy UK will be releasing a news story on the misconceptions around allergy, and the campaign in general will focus on what it’s like having an allergy in 2016. Allergy UK has conducted a survey to see why attitudes towards those who live with allergy haven’t changed over the last 25 years, even though we’ve come a long way in educating people about allergic conditions. Each day of the week will focus on a particular allergic condition, meaning they will be covering the topic of allergy as a whole. Keep an eye out on their social media pages and the website every day during the week to see more details on the topic they will be discussing and the activities surrounding it. An allergy is the response of the body’s immune system to normally harmless substances, such as pollens, foods, and house dust mite. Whilst in most people these substances (allergens) pose no problem, in allergic individuals their immune system identifies them as a’ threat’ and produces an inappropriate response. Allergies are classified into IgE mediated and non-IgE mediated allergies. In IgE mediated allergies the immune system produces exaggerated amounts of a distinct class of antibodies known as IgE antibodies that are, specific for the particular offending allergens. These IgE antibodies bind to the surface of cells in the body called mast cells which become ‘IgE-sensitised’ such that these cells can then identify particular allergens the next time they come in contact with the body. This process is called sensitisation, and at this stage there are no physical symptoms of an allergy. Mast cells are present in tissues that are in contact with the external environment, including the skin, nose, eyes, mouth, throat, stomach and gut. The next time that the same allergen is encountered the mast cells identify it as an intruder and produce histamine and other chemicals. It is the release of these chemicals from mast cells and their effects on the body that result in allergic symptoms. IgE-mediated allergy may cause a wide spectrum of symptoms depending on the allergen and the site of the body affected. In the nose histamine release results in symptoms of runny nose, itchy nose sneezing (rhinitis) that are commonly associated with itchy red eyes (conjunctivitis). In the skin symptoms include redness and nettle rash (hives, wheals). In the breathing tubes allergies cause wheezing, cough and shortage of breath (asthma), whereas in the gut symptoms such as abdominal discomfort (‘tummy ache’), nausea, vomiting and diarrhoea may occur. Severe allergies may result in throat swelling, severe asthma and a drop in blood pressure. Severe allergic reactions are also known as anaphylaxis, and can be life-threatening. The immune system may also respond to allergens without the production of the IgE antibody. The mechanisms of these so called non-IgE mediated allergies are far less well understood and are likely to involve multiple cells that react inappropriately to the presence of an allergen. Whereas symptoms of IgE mediated allergies occur rapidly and soon after exposure to the allergen, this may not be the case with non-IgE mediated allergies where symptoms may appear much later. In these cases it can be much harder to determine whether the problem is allergic in nature and if so which particular allergen is causing the problem. Allergy is widespread and affects approximately one in four of the population in the UK at some time in their lives. Each year the numbers are increasing with as many as half of all those affected being children. Attachment:- Allergy Awareness Week Poster. As in previous years, we will be showcasing the work carried out by the Education & Training Department at our stall (stand number F8) in the exhibitors area during Annual Conference 2016. Please come and raise any questions or issues you may have about Education and Training. You can obtain information about CWU Lifelong Learning projects around the country and / or book yourself onto a course as well as meet members of the E&T Department to discuss your activist development needs, whether they be informal or formal courses. Tutor colleagues from Ruskin College who coordinate, develop and deliver our education and training programme throughout England will also be in attendance. We will also be running our traditional “caption competition” with an “iPad Air” as a prize. Additionally, if you wish to make an appointment to meet with Trish Lavelle, the Head of Education and Training; please can you contact Michelle Simpson on 020 8971 7340 or e-mail Michelle at msimpson@cwu.org and she will ensure your appointment is put into Trish’s diary. As has now become tradition young members are welcome to join some of the Youth Committee for a drink on Sunday, 24 April at the Moon in the Square pub from 18:00: A very informal get together where young members can meet up prior to any formal events that have been arranged for later that evening. Branches are asked to encourage any younger delegates to visit the stall during their visit at conference – they will not only be able to meet up with other younger members, they will be able to chat with members of the Youth Committee, pick up information for the National Youth Education Event and the forthcoming Branch Youth Officers’ Forum in June. You will recall that in implementing the terms of this motion we wrote to all Branches via LTB 565/16 seeking their views and asking for responses to be returned to CWU HQ by no later than Friday 16th October 2015. At the closing date for submissions only 6 Branches had responded expressing various views. It was clear that these 6 responses did not produce a consensus. As a result of the low number of responses the NEC discussed this matter and agreed with a conclusion that 6 branch responses were not a valid enough sample upon which an informed decision could be made. As a result the NEC decided that we should again attempt to engage branches and accordingly a further letter was sent to all branches that included a 10 point questionnaire to try and focus the debate in the hope that this would generate a greater expression of views to inform decisions of the FOS and NEC. As a result of that LTB (020/16), 21 responses were received at CWU HQ. This represents a 15% participation rate. Again the NEC are of the view that given the issue we are dealing with i.e. our only source of income, a 15% return is not a sufficiently robust enough sample upon which to make changes to how we currently operate. The NEC believes this position to be even more relevant when the views expressed are read and considered. The major point here being that there is no clear cut consensus amongst the respondents as to what any ideal solution or alternative would be regarding how we could change our current plan structure and rates. In considering the responses and by way of example with regards to the branches positions, to the question about the current structure causing confusion when recruiting new members 13 branches say it does while 5 say not with 1 being unsure. 13 is less than 10% of our total branches. Even then when you read the commentaries attached to that question it is not even as clear cut as a 2:1 split. When you consider the important question that has been expressed about the rates we charge and their impact upon recruitment the picture is even more indecisive. Asked if the rates should be discounted for new members rising to existing rates the responses are 8 agreeing with 8 disagreeing. Again the commentaries to back up those views make it far from a black and white issue. Almost the same split 7:8 is received when we ask if there should be a fixed term versus temporary contract rate charged. The NEC clearly had a difficult decision to make in this matter. However they have to take into consideration that on not one of the questions asked do any of the (small) number of responses have unanimity. The question under consideration then is if major change is needed based on a small number of replies and upon which, on some of the main questions, views are fairly evenly split. In conclusion the NEC felt that given the importance of the issue to us all i.e. it is our income we are dealing with, there is no real momentum to change how we currently operate i.e. a change to the current number of plans in place and the difference between the rates charged. The NEC agreed therefore that the current plan basis we have for subscriptions within the CWU remains, at this point in time. However the NEC are also mindful of the review instigated by the General Secretary within the CWU and proposes that we revisit the issue again once that redesign and restructuring work is complete. This then left the question of a subscription rate increase for 2016. The NEC had deferred making a decision on this matter when they previously discussed it, towards the end of 2015. This was reflected in the fact that no increase was announced for either the 1st January 2016 or the 1st April 2016. In considering this matter and in acknowledging the assistance given to us by the branches that did respond, the NEC have taken the view that there will be no increase in CWU subscription rates during 2016. The earliest date we could next increase subscriptions would be 1st January 2017. This would be a gap of 21 months since the previous increase. This decision throws up a challenge, an increase in subscription rates on 1st January 2017 is not a given but as a collective we have to work together to recruit more members in such numbers that would in turn render a subscriptions increase at that date unnecessary. The NEC believes that by taking this course of action we have listened to those Branches who believe this issue i.e. the amounts we currently charge, to be a barrier to recruitment. Therefore, this now gives branches a small amount of headroom to go out and recruit knowing there will be no increase in rates for the remainder of the year. The formal decisions of the NEC on this matter then are 1) The current subscription rate plans remain unaltered and that once our redesign and restructuring project is complete we visit this matter again and 2) It is agreed not to increase CWU subscription rates beyond their current levels during 2016. The NEC wishes to thank those Branches that took part in this exercise and we believe that our actions show we have engaged positively on this matter and by not increasing subscription rates during 2016 demonstrates that we have listened to the comments received. We do not believe, when taking into consideration the diversity of views expressed, that enough evidence exists upon which to make wholesale changes to our income stream arrangements at this point in time. “Accordingly Branches are now invited to forward questions to the attached CWU Consolidated Accounts 2015 to arrive by no later than 12:00 hours on Wednesday the 20th April 2016. We are seeking an explanation regarding the increased superannuation schemes administration cost. In 2014 the costs were £308,686, but in 2015 £637,862. Can you also give the projected cost for future years going forward? The costs over and above the 2014 costs have risen as follows. CWU 2000 Scheme increase of £19,744. NCUSSS increase of £91,776. UCW 2001 Scheme increase of £233,820. Employers pension advice decrease of £21,164. The increase in costs in the CWU is relatively small and simply reflects the increase in costs necessary to run a scheme that has the majority of CWU employees in it. As a relatively immature scheme it has the lowest of the admin charges of the three schemes the employer sponsors. For the future and following the 2014 triennial actuarial valuation we have agreed that the CWU will pay scheme admin charges of £140,000 p.a. up until the next valuation (Dec 2017). For the NCUSSS and the UCW 2001 Schemes the issue was that in prior years i.e. pre 2015 these payments were being shown as part of the deficit contribution in the Statement of Financial Position (balance sheet) as part of the pension deficit in the formal accounts. These administration costs are not part of the deficit and should be shown in the Statement of Comprehensive Income as part of the head office expenditure. In 2015 they have been shown correctly, which is the reason for almost the entirety of the increase. These contractual administration costs came to £361k and were made up of £113k costs for the NCUSSS scheme and £248k of costs for the UCW 2001 scheme. For the future and following the triennial valuation we have agreed that the CWU will pay admin charges to the NCUSSS of c.£125,000 p.a. and to the UCW 2001 Scheme £150,000, until the next valuation (December 2017). With regard to the future it is entirely possible, depending on scheme investment performance or changes to market conditions that extra demands will be placed upon scheme administration costs to ensure the scheme funding positions remains as good as they possibly can. This could incur additional costs over and above the costs identified above, these figures being the best we are able to forecast and establish at the time of concluding the 2014 triennial valuations. This is just a short LTB to update Branches on some planned activities at this year’s Annual Conference. As with previous years, we are planning to live stream both Rules Revision and General Conference on http://www.cwu.org – Further details of this will be advertised on the website by the end of this week. Furthermore, we are also attempting to negotiate the streaming of our #JC4PM event on Tuesday evening. Again, we will update branches once we have confirmation of this. Finally, please find attached a copy of our fringe leaflet which will be distributed on Sunday.